A sample video showing the capabilities of the plug-ins the bundle. As human beings, our perception of depth is key to our feeling of scale and proximity...our entire sense of 3D space. When the entire image is in focus, the viewer loses the sense of the Z dimension in the material, be it a still image, a motion picture or video, or motion graphics. 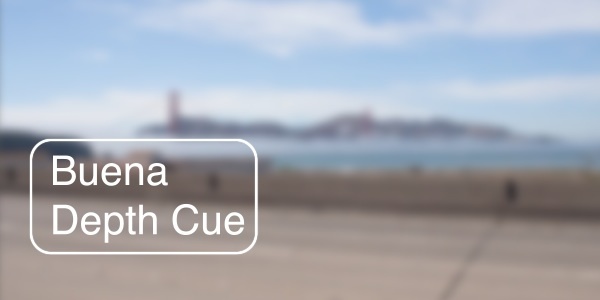 Buena Depth Cue's Depth gives you the ability to add these differences in focus to your images or motion graphics after they’ve been created. Using the ability of Depth to create a depth map, you generate a gray scale 'layer' that drives the difference in how effects are applied to a clip in After Effects. It's like an "alpha channel" for focus instead of transparency. If you require more virtual camera movement, use the ‘precomposite depth’ feature to allow a greater range of animation and viewing angle. If you work in 2.5D and want to achieve realistic results, Buena Depth Cue's Depth will quickly become an indispensable tool. Add Rack Focus to your composition and setup the depth of field and the Z distance of the focus target in moments. The viewer's perception of depth in your composition changes and the feeling of dimension and space becomes more authentic instantly. Move the viewer's focus within your images the way a cinematographer would by confining sharp focus to just specific areas or objects, or define the order that text is read in by controlling how it comes into focus. Creating virtual camera moves in simulated 3d space using only 2D images can be done a number of ways. Creating 3d surfaces and mapping them from the photograph can be time-consuming. Camera "projection" has become a very efficient method of accomplishing these tasks. Without using an application outside After Effects, Digieffects' Camera Mapper alllows you to take a 2D video or a photograph, add some simple solids and map specific segments of the photograph to multiple planes in 3D space to create a convincing environment for a virtual camera movement through 2D images you've already acquired. One of the key capabilities added to 2D compositing applications has been the ability to simulate 3D space by rotating flat, 2D elements in a scene. In cases where a 2D element has to rotate to reveal the "back" surface...it's still the front surface-backwards. Combatting this issue requires a steady hand, carefully positioning an additional layer in 3D space so that the separation between the layers is small enough to be hidden, but deep enough that the rear surface never 'touches' the front, creating occlussion which makes the entire process rather frustrating. When we’ve acquired Buena Depth Cue, it wasn’t compatible with After Effects CS6 and CC. We had to rewrite certain parts of it to make it compatible with the latest versions of AE and also to provide support to existing customers we’ve decided to charge a small upgrade fee (70% off of sale price). If you are using older version of AE (CS5.5 and below) you can continue to use the older version of the plug-ins. But for CS6 and above the older versions don’t work properly and we recommend you upgrade to the newest version. To get the upgrade discount, during checkout enter your old serial number in the discount code and it will show you the updated discount price. See here for visual reference.